Another total transformation before-and-after cut! 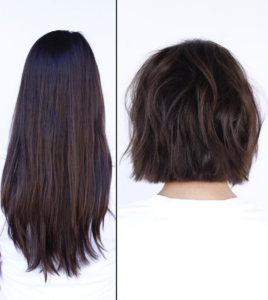 As visible from the photo on the left, the ends of the model’s hair were uneven, overly grown out with broken ends, giving the hair the appearance of being thin, lifeless and even shorter than it actually was. By updating the model’s look with an above-the-shoulder length parallel undercut, blunt bob, it becomes instantly refreshed, healthy and modernized with a chic French girl vibe. The cut is finished off by styling with the NuWave technique and a bit of L’Oreal Professional Next Day Hair for casual texture.